Sergio Castelluccio takes down the first-ever World Series of Poker Circuit Main Event in Italy for €114,100. "I have never won a WSOPC ring in my career, and I feel great now that I have one," says Sergio Castelluccio. Italy's first-ever World Series of Poker Circuit Main Event wrapped up at the Casino Campione on Tuesday night when local hero Sergio Castelluccio took down the title and won the €114,100 top prize. 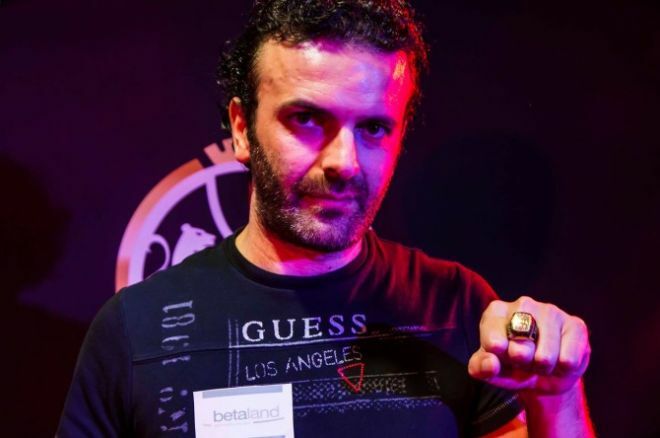 To bring home the first WSOP Circuit ring of his career, Castelluccio survived a field of 612 players that included many of Italy's top poker players such as 2015 November Nine Federico Butteroni, Poker Hall of Fame nominee and four-time WSOP bracelet winner Max Pescatori, former PokerStars Pro and WSOP bracelet winner Dario Minieri, WSOP APAC champ Scott Davies, and the accomplished Zach Wilson. The huge number of players who turned out for the debut of the WSOP Circuit in Italy made the €990 Main Event held in Campione the biggest among all the Circuit events held in 2015. "I thought I had some good chances to win [the Main Event] but I wasn't too sure I could make it," Castelluccio said while receiving the WSOPC ring. "I have never won a WSOPC ring in my career, and I feel great now that I have one, especially as it comes at the end of a long event like this one." We are very pleased with the event, and that's why I want to thank all the people who worked in the organization for the great work they have done to make this possible. After his latest success, and thanks to the six-figure prize he took home, Castelluccio now sits ninth on Italy's all-time money list (source: the HendonMob) with live tournament winnings of $1,812,074. The WSOP Circuit victory allowed him to pass Andrea Dato ($1,709,847) and to get closer to Minieri, who sits eighth in the rankings with live tournament winnings of $1,897,580. Amongst Castelluccio's most remarkable results are a first-place finish in the Italian Poker Tour (IPT) Sanremo in 2010 for €200,00, a fourth-place finish in the 2012 EPT Grand Final Main Event in Monte Carlo for €400,000, and a fourteenth-place finish in 2013 WSOP Main Event for $451,398. Earlier this year, Castelluccio won the Italian Poker Tour (IPO) for €24,323, and put together several more cashes including ones in the World Poker Tour in Montenegro and in the EPT Grand Final Main Event in Monte Carlo. "We are very pleased with the event, and that's why I want to thank all the people who worked in the organization for the great work they have done to make this possible," the Director of Games at Campione Casino Sergio Frigerio told Italy's GiocoNews. "To us, the WSOPC were and are a great opportunity to show that Campione d'Italia is one of the true leaders in the poker world - not only in Italy but also at the European level. Right now, we have seen an increase in our revenues that is caused mainly by poker and, considering how the industry is moving, this is a very encouraging sign."